The Pascagoula Incident involved two men, nineteen-year-old Calvin Parker and forty-two-year old Charles Hickson, both of Gautier, Mississippi, who were fishing in the Pascagoula River when they heard a buzzing noise behind them. Both turned and were terrified to see a ten-foot-wide, eight-foot-high, glowing egg-shaped object with blue lights at its front hovering just above the ground about forty feet from the river bank. A door appeared in the object, and three strange Beings floated just above the river towards them. The Beings had legs but did not use them. They were about five feet tall, had bullet-shaped heads without necks, slits for mouths, and where their noses or ears would be, they had thin, conical objects sticking out, like carrots from a snowman's head. They had no eyes, grey, wrinkled skin, round feet, and claw like hands. Two of the beings seized Hickson; when the third grabbed Parker, the teenager fainted with fright. 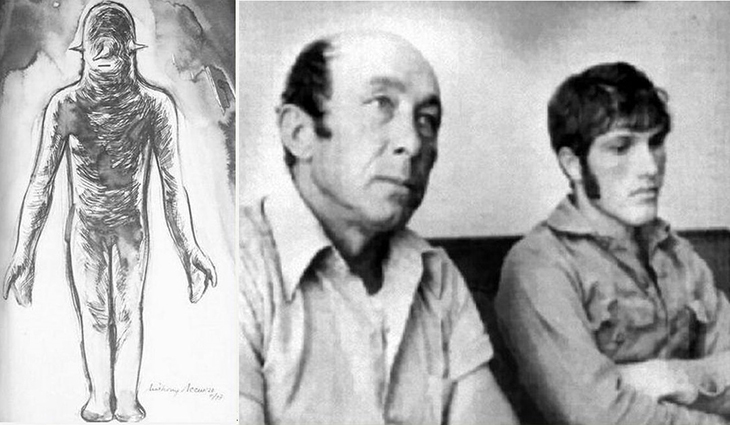 Hickson claimed that when the Beings placed their hands under his arms, his body became numb, and that then they floated him into a brightly lit room in the UFO's interior, where he was subjected to a medical examination with an eyelike device which, like Hickson himself, was floating in mid-air. At the end of the examination, the Beings simply left Hickson floating, paralyzed but for his eyes, and went to examine Parker, who, Hickson believed was in another room. 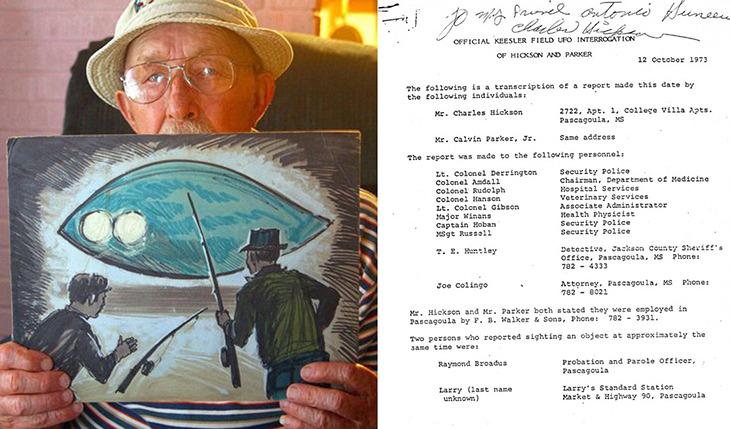 Twenty minutes after Hickson had first observed the UFO, he was floated back outside and released. He found Parker weeping and praying on the ground near him. Moments later, the object rose straight up and shot out of site. Expecting only ridicule if they were to tell anyone what had happened, Hickson and Parker initially decided to keep quiet; but then, because the government might want, or ought, to know about it, they telephoned Kessler Air Force Base in Biloxi. The local press reported their tale and within several days the Pascagoula Encounter was major news all over the country. The Aerial Phenomena Research Organization (APRO) sent professor James Harder to Mississippi to investigate; J. Allen Hynek, representing the Air Force, also arrived. Together they interviews the witnesses. Harder hypnotized Hickson but had to terminate the session when Hickson became too frightened to continue. Hickson and Parker both subsequently passed lie detector tests. Hynek and Harder believed the two men's story. And Hynek was later quoted as saying "There was definitely something here that was not terrestrial".